A band, a location, and yearly tradition: in the course of their XLIX-Tour and 50th anniversary, Wishbone Ash played Vienna’s Reigen once again. A concert comparison. »Good evening! Raise your hands, are you feeling good tonight?« are the words with which frontman Andy Powell greets the audience as Wishbone Ash march onto stage at 20.30 sharp. Powell (guitar, vocals) is the only remaining founding member and 50 years active this year. The other musicians Bob Skeat (bass), Joe Crabtree (drums), and Mark Abrahams (guitar) have joined the band at different points over time. Compared to the gig on February 11th, 2016, at which I saw the band last, the formation only changed guitar-wise from Muddy Manninen to Mark Abrahams. A lot of back then is also visible tonight: the perfectly chosen location, that offers not only a relaxed ambience and lots of space, but also a very good sound quality; the respectful, slightly elderly audience; the few die hard fans, whose thumbs are up during almost the entire show; the singer’s sunglasses; the bassist’s familiar smile, paired with the twitching left corner of his mouth when playing dynamic passages. The setlist, too, intersects with songs like »Deep Blues«, »Blowin‘ Free«, »Throw Down the Sword«, »Warrior«, »Front Page News«, »Phoenix«, or »Sometime World«. Again, however, the band choses not to play »Helpless«, one of my favourites, to be found on »Live Dates 2«. This time, too, most fans are surprised about the few younger people in the audience. It is indeed a mystery why Wishbone Ash does not ring a bell with the younger generations – when one can easily compare their technical precision, professionality and melodic finesse to Pink Floyd’s, for example. They probably just aren’t that commerical, even though they were quite famous in the 1970s and 80s. It’s not for nothing that almost any rock band – Thin Lizzy and Iron Maiden being only two among them – lists Wishbone Ash as one of their role models and sources of inspiration. We are speaking of a band which, at the end of the day, has never been given the fame it actually deserves. Thus, the unavoidable question is: Why are Wishbone Ash only for deep-rooted rock fans, when the music (albeit experimental) is neither incomprehensible nor inaccessible, but functions via exuberant melody as ist highest value. Possibly, no other band understands so well how to make their guitars sing like Wishbone Ash do. And that alone is something any listener is potentially able to connect to. In course of their „ROAD WARRIOR“ tour, Wishbone Ash did a show at Vienna’s Reigen on the evening of february 11th. The location was perfect for the event, regarding not only capacity and ambience, but also its great sound quality. The people in the audience were mostly, well, about 50 years old – which is of course not surprising, considering the band was founded in 1969. I am still glad, though, that there were a few young people, too – such a shame to miss out on a group like this one! 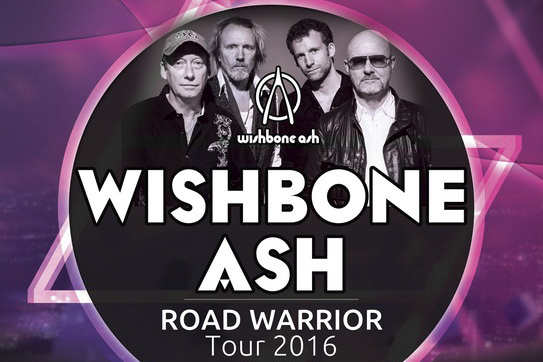 Wishbone Ash – a British band who counts its 45th year, are now on the road in a group of four, with Andy Powell (guitar, vocals) being the only founding member left. Like so many other great rock bands, Wishbone Ash has undergone lots of changes considering band members. The momentary line-up is completed by Bob Skeat (bass, backing vocals), Muddy Manninen (guitar, backing vocals) and the fairly young Joe Crabtree (drums). After opening the show with The Power of Eternity, they presented some material from their latest and 25th studio album Blue Horizon, which was released in february 2014. They selected the tracks Deep Blues and Way Down South. The most songs, however, were from their third album Argus: Sometime World, Throw Down the Sword, Blowin’ Free and Warrior (one of their greatest, to be sure). Furthermore, they played evergreens such as Open Road, Front Page News, Rock ‘n‘ Roll Widow, The Pilgrim, Heavy Weather and Living Proof. The crucial thing about Wishbone Ash’s sound are the twin guitars, the band itself listing Thin Lizzy and Iron Maiden (among others) as musical influence. As simple as the idea of simultaneously playing one and the same tune on two guitars may seem: it is not that easy, especially if supposed to have significant stylistic effects. It has to be done with perfect accuracy – or else it is bound to be most irritating for any listener. On that account it is only right to say that Wishbone Ash have perfected this style for their music. How the two guitarists completed each other’s playing during differing parts, however, is probably even more impressive. It was like two instruments having this really unique sort of dialogue where both parties understand what the other wants to say – and not say – at all times. While I had the impression that Powell played more of the solos, Manninen was sure to impress the audience with his glissandi skills (with and without bottleneck). I was no less convinced by bassist Bob Skeat, who played the craziest parts with such ease, constantly smiling, as if he was merely having his morning coffee on a free day. The critical point for me were the drums, which were pretty lax the whole time – I think Joe Crabtree should put a lot more energy and force into his performance. As last song of the encore they played Phoenix, a ten-minute instrumental track. It was a truly great concert, everything was right: the mood, the band, the audience. The only disappointment for me was that they did not play my favourite song: Helpless. I am afraid that will have to wait until next time.